IzzyElfBlog: ANSWERING THE BURNING QUESTION: WHERE DID WE IZZIES COME FROM??? ANSWERING THE BURNING QUESTION: WHERE DID WE IZZIES COME FROM??? 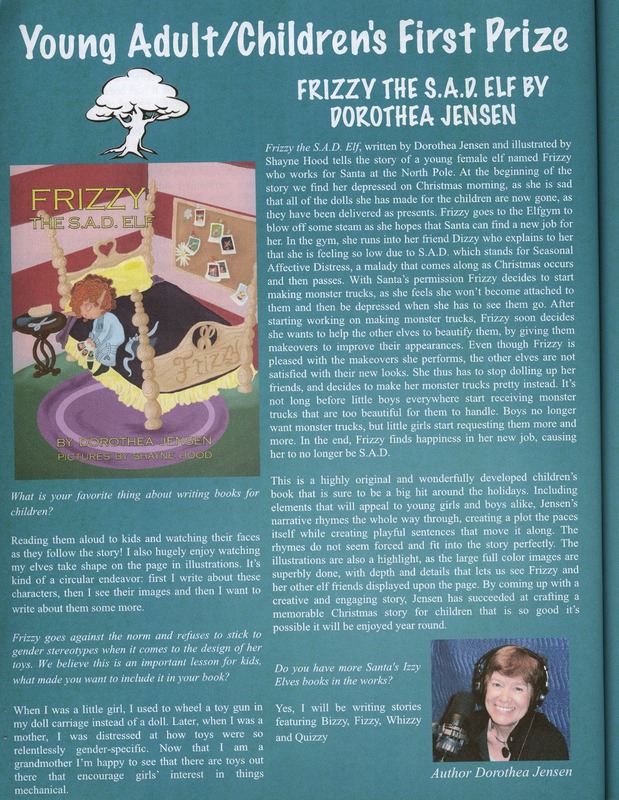 So Bizzy was searching the internet and found something that Deedy (AKA Dorothea Jensen) wrote about how she started making books about us Izzy Elves. Some of this we already knew, but a bunch of it is NEWS to us. Please don't tell Deedy we found this: we think she doesn't want us to know all this "behind the scenes" stuff! I answered a number of questions for the Red City Review which could not be included in this article because there wasn't room. So I'm putting ALL my answers here. Hope you don't find it TMI ! Q. What inspired you to write a book about elves? We've explored your website and are aware that Frizzy is the fourth book in your series. A. When I was about four, my father, a family doctor, went on a home call very early on Christmas morning. When he came home, he decided to turn on the Christmas tree lights. In doing so, he knocked over the tree and the crash woke us all up. I thought that we had trapped Santa in our living room and was desperate to see him. My older brother, however, refused to let us go downstairs. I was very disappointed. I think the germ of having Santa (or one of his elves) stranded in a family’s living room came from this experience. My first elf story, Tizzy, the Christmas Shelf Elf, is based on it. Then, when I had Tizzy tell the boys who found him about his elf colleagues, I started trying out various consonants with –izzy and found some amazingly apt names. They are: Blizzy, who makes snowglobes; Bizzy, who is the bossy, know-it-all elf; Fizzy and Dizzy, who make toys that surprise; Whizzy, who always rushes around; Frizzy, who styles the hair of Christmas dollies, and Quizzy, who makes puzzles and word games. Of course, the original –izzy name came from the fact that the stranded elf was, well, in a tizzy! His job is not revealed until the next book, however: Tizzy picks out books for Santa to bring to each child. Once I named all eight elves, they started taking on little personalities and quirks, and before I knew it, I’d written three more stories: Blizzy, the Worrywart Elf; Dizzy, the Stowaway Elf (in which Santa does actually knock over a Christmas tree); and Frizzy, the S.A.D. Elf. Just for fun, I put my four grandsons into two of the stories, and made the Izzy Elf Section of the North Pole (and Santa) very savvy in 21st century technology. I always loved “A Visit from St. Nicholas” and all the Dr. Seuss books, and so decided to write my elf stories in rhyming couplets. I seem to have a knack for this, so once I figured out the plot for each book, the actual writing went very quickly. It’s great fun, actually. Q. Do you have more Santa's Izzy Elves books in the works? Also, I have two more grandsons now and have to figure out where they will fit into a story. Q. What is your favorite thing about writing books for children? A. Reading them aloud to kids and watching their faces as they follow the story! I especially like reading my elf books aloud to my grandsons who are just learning to read, and letting them figure out what the rhyming word is at the end of each couplet. They love doing that. Q. If you could tell parents the best reason for buying your books for their children, what would it be? Q. Frizzy goes against the norm and refuses to stick to gender stereotypes when it comes to the design of her toys. We believe this is an important lesson for kids, what made you want to include it in your book? When I was a little girl, I used to wheel a toy six gun in my doll carriage instead of a doll (my main playmate was my older brother). My mother told me that this was quite unnerving for little old ladies who peeked into the carriage to see my cute little “dolly”. Later, when I was a young mother of two boys and a girl, I was distressed at how toys were so relentlessly gender-specific. Now that I am a grandmother (even though all six of my grandchildren are boys) I’m happy to see that there finally are toys out there that encourage girls’ interest in things mechanical. I didn’t deliberately decide for Frizzy to design monster trucks that eventually appeal to girls, however. The idea just popped up in my brain—although this probably happened because the experiences above are buried in there somewhere!